You asked us earlier if we plan to add new things to the game after the big release and last week, we let the cat out of the bag (gentle-cat doesn’t mind) about our season pass and free updates during the post launch of Anno 1800. With our announcement of the season pass, we also recorded a video for all of you where we talk about our plans to expand the world of Anno 1800. Luckily, Basti was far from alone with our small release celebration on Twitch. Thank you to everyone who joined our rather spontaneous stream, we had a “jolly” good time especially thanks to so many Union members chatting with us during the show. And when we kicked off the party, we released our third Union Talk video which was, of course, pre-recorded. (Just because some folks in the chat asked us questions). Last but not least, let’s talk about your feedback and reports. Fixed an issue for the Steam version, that made the games FPS drop significantly. Fixed a rare issue, getting no further quests, after loading a savegame that has been created while a Newspaper was displayed. Diplomacy: Lowered the cooldown of “Flattering” and “Gifting” from 60 mins to 30 mins. Diplomacy: Negotiations in the late game now cost ~70% less. Visitors: Visitors are now more generous (Visitor income increased by 50%). We will continue to improve the game in the future so keep up the good work and share your feedback in the Ubisoft Anno forum. With that being said, we had an incredibly exciting, successful as well as very busy first launch week. As there are two bank holidays about to come up in Germany, we will recharge our batteries in over the long weekend and will be back in the studio next week Tuesday. 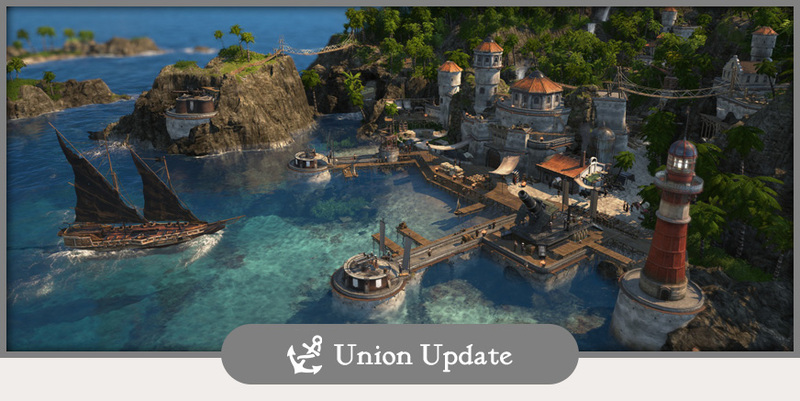 Thanks to all members of the Anno Union for that incredible launch week and keep in mind: leave the PC once in a while to get a coffee or to stretch your legs! After rubbing our eyes in disbelief when looking at the calendar, we have to face the facts- Anno 1800 is only six days away from launching the franchise into the age of the industrial evolution! 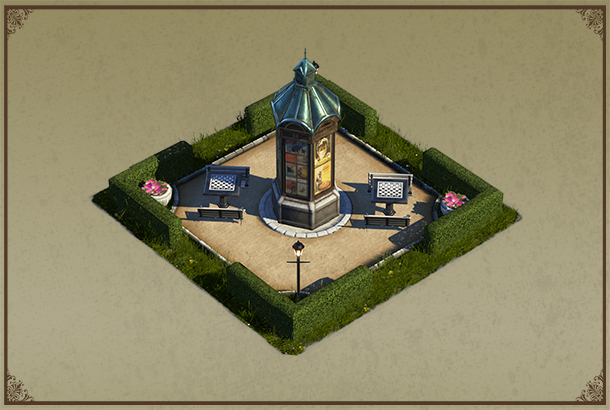 In last week’s update, we extensively covered the topic of our Open Beta (reminder: everyone can participate via Uplay and Epic Games store between April 12-14 to earn a fancy Open Beta ornament for their city’s parks). This week, we turn our attention to answering many of your burning questions surrounding the game’s launch (such as pre-loading, day 1 patch, when the game goes live etc.). We also have some live streams to announce, and encourage you all to take another look at our beautiful open beta trailer. So let’s get started! Pre-Loading for anyone with a digital pre-order on Uplay, Steam or the Epic Games Store will begin on April 12 at 3pm UTC . The total download size will be around 25 GB. Update: Pre-loading will start on April 11 at 3pm UTC, and not 9am as had been previously communicated. We apologize for this change. We have been busy bees and worked hard to further improve Anno 1800 after we shipped the gold discs off to the factory to produce all the physical copies of the game. That means that anyone who bought a physical copy of the game will need to download our Day 1 Patch before they can start playing (the patch is already part of the pre-load for digital buyers). The Day 1 Patch will come in at roughly 23GB. We are currently ironing out the last details and will give you an update on the exact launch timing as soon as possible. As previously announced, you won’t be able to carry over existing downloads or save games from any of our test phases (Technical Test, Closed Beta or Open Beta), so feel free to delete them to free up space. This should give you answers to the most pressing questions regarding the launch. But before you have to worry about that, there’s out Open Beta coming this week! And what better way to get into the Anno mood than with another look at our Open Beta trailer? With only one more week to go, we will of course have some more streams for you all to enjoy as we count down the last final days until Open Beta and launch. Friday afternoon while have another Anno Afternoon with Guddy and John continuing their Anno 1800 adventures. Join them for a relaxed fun time at 3pm UTC. Hey, with your help, there is a high chance that they manage to push forward into the fourth residential tier! That’s it for this (very busy, and filled to the brims with Anno-goodness) week. See you in the Open Beta! In today’s update, we detail everything you need to know about our upcoming Open Beta and reveal the much-requested final system requirements for Anno 1800! The Open Beta is the perfect opportunity for you to test the game prior to its launch. 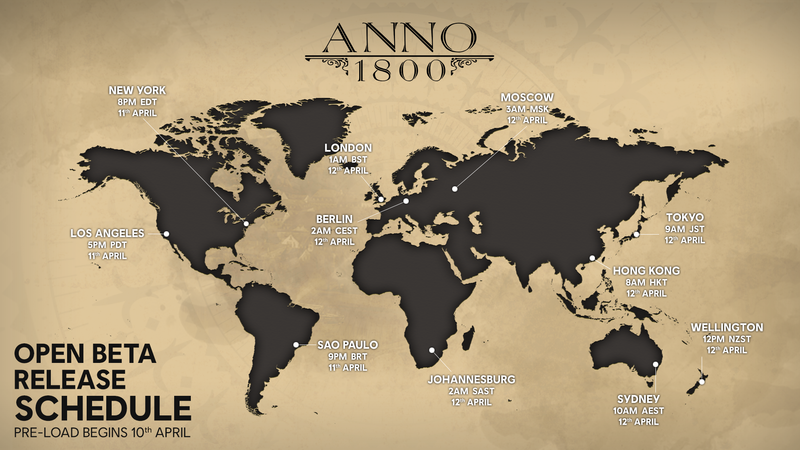 Starting on April 12 and running until April 14, it will give everyone in the community a final chance to test Anno 1800 prior to its release on April 16. You will be able to test a near-final version of the game and see the improvements since our Closed Beta for yourself, including access to the Multiplayer mode. Moreover, while game progression will again be capped at tier 3, we will for the first time invite you all to get your hands on Anno 1800’s story-based campaign, as the complete first Act will be part of the Open Beta. With this being an Open Beta, there won’t be a NDA. Therefore, you are not only allowed, but also in fact highly encouraged to share your experiences and to create content, whether it is streaming, videos or resource calculators! If you’re on Social Media, make sure to use the Hashtags #Anno1800, #AnnoUnion und #Anno1800OB and tag our channel @Anno_EN. That way we can share all your great creations with the rest of the Annoholics community. Your Open Beta save games won’t carry over into the final version of Anno 1800, so you are free to go absolutely crazy and try wild things without having to worry about long-term repercussions. You also won’t be able to update the Open Beta to the full release version, so feel free to delete the Open Beta as soon as it sends to save space on your hard disk. We always try to give you some context and explanations for your decisions- so why can’t your save games be carried over? One key reason is the way our AI works in the game. As the Open Beta content is limited to the first three (out of five in the full game) citizen tiers, the AI will of course also be blocked from progressing any further (as to not have an unfair advantage compared to human players). This could lead to issues with the AI if you were to carry your save game over into the full game, where they would suddenly have access to tiers 4 and 5 again. Our top priority is to ensure that you will have the best possible experience playing Anno 1800 on April 16, so to avoid any issues with such scenarios, we decided against carrying over save games. Rest assured that this issue won’t appear in the full version, where there are of course no limitations on the available content (for either AI or human players). Is there a reward for participating in the Open Beta? We are glad you asked- yes there is! Participants in our Open Beta will be able to earn the exclusive “Chess Table” decoration, which can be claimed from the Ubisoft Club after launch! All you need to do to earn it is to play at any time during the Open Beta period. How to play the Open Beta? 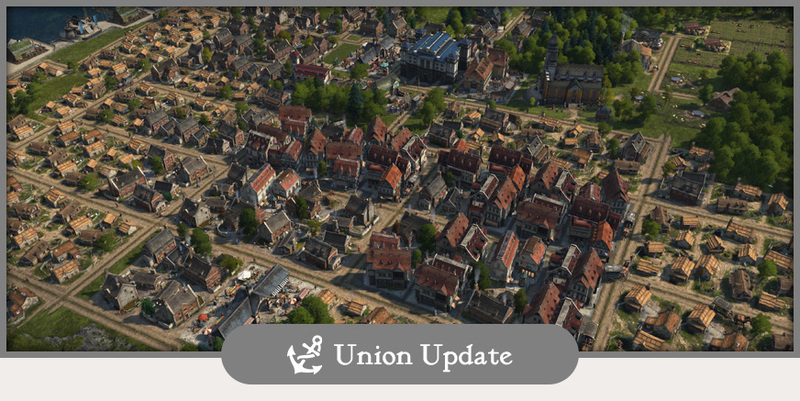 Anno 1800’s Open Beta will be available and open to everyone via Uplay or the Epic Games Launcher. You won’t have to register at the Anno Union and can just download the game as soon as the pre-load becomes available from your launcher. We prepared a chart for you with the release timing of the Open Beta. To make sure you are ready the moment the Open Beta begins, we will also offer pre-loading starting from April 10. We also want to give you a heads-up that the Open Beta will require a constant internet connection to play. Please note that this is not the case with the main game, as you will be able to fully enjoy Anno 1800’s singleplayer modes while being offline! 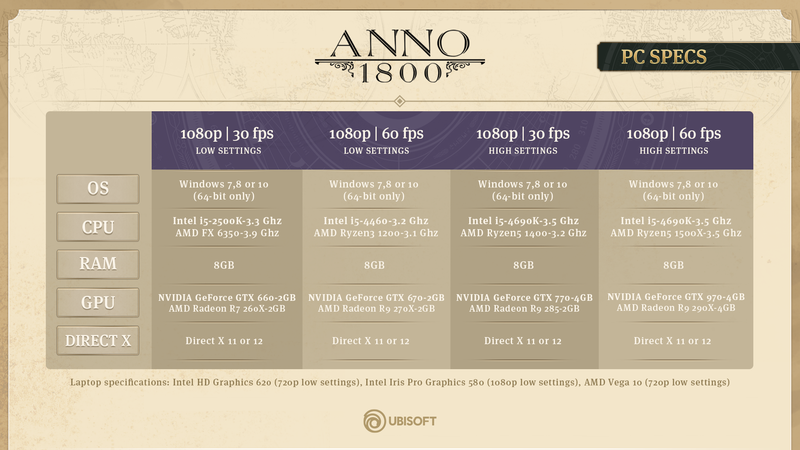 After spending some additional development time optimizing the game performance following our Closed Beta, we are happy to finally announce the official system requirements of Anno 1800. We tried to break them down into some of the most common settings scenarios to give you a better idea of what to expect. We have also been hard at work with our friends at Intel to optimize the game for integrated GPUs, and are happy to be able to include some of Intel’s iGPUs in our system requirements matrix (a first for the Anno series!). We hope that this will allow an even wider group of players to explore the industrial revolution with us. Anno 1800 will be playable at EGX Rezzed 2019. This year’s event, taking place at London’s Tobacco Dock on April 4-6, is an opportunity for you to lead the industrial revolution and try out new gameplay. Also, join Bastian Thun, Anno Community Developer, on the Developer Stage on Thursday 4pm GMT+1 as he provides an insightful commentary into the world of Anno 1800. You can also head over to their Develop session page to find out more details. 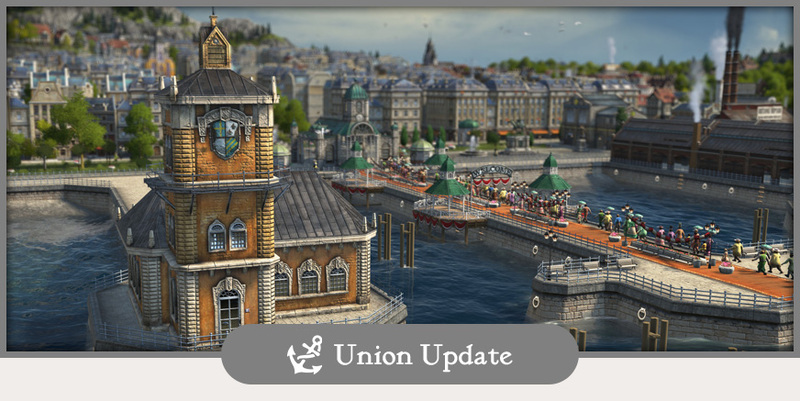 Keep an eye on the Anno Union as we will share the live stream on our website this Thursday at 4pm CET. Following the stream from EGX on Friday, we will have a new episode of our AnnoAfternoon community show where Guddy and John need your help to steer their empire successfully through the industrial revolution. As always in our community livestreams, you can have an impact on the way we play while meeting other Anno crazy strategy game aficionados. 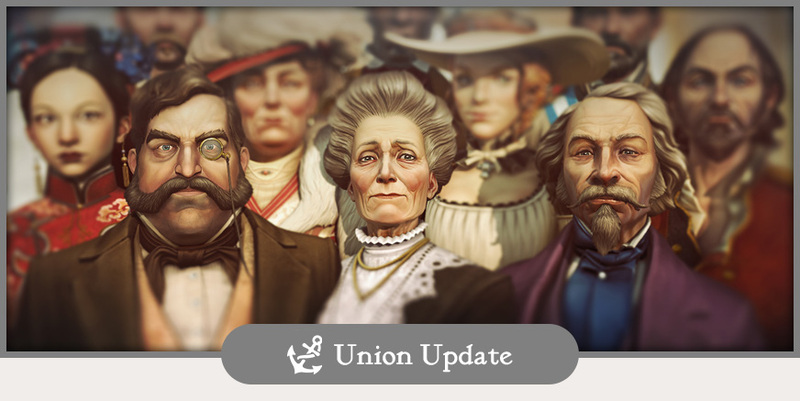 Union Update: Meet your rivals! 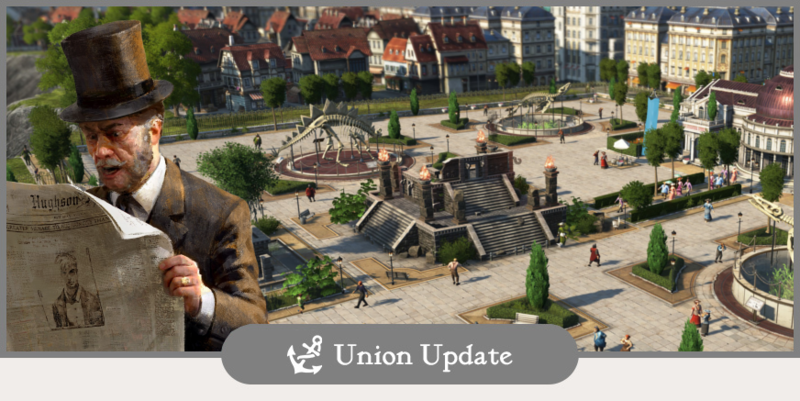 Welcome to another week in the Anno Union, this time with an introduction to the cast of Anno 1800 second party characters as well as an update to the streaming schedule. Originally planned for the end of last week, we prepared a video for you showcasing the variety of AI opponents which will be able to choose as your dire enemy or future to be ally. Every single rival will have their own character, which will not only define their general difficulty rating but also influence their playstyle. Since the Closed Beta, we improved their behaviour in many ways and while old chap Willy will remain let’s say, a slow and simple fella, the AI’s capabilities of defending islands or deciding on various tactics fitting to the situation has improved a lot. As an example, especially war savvy characters will make decisions such as attacking your Harbour directly, engaging your war fleet or launching attacks on your trading routes based on the current situation. Are you looking forward to testing your skills in naval warfare against the Psychopath Graves or are you more interested in Tea parties with Bente Jorgensen? We are curious to know how important the second party opponents are for you and if you are more the player who likes to challenge themselves with the most fierce of opponents? Streaming Schedule – 2 streams on the horizon! As promised during our special German episode of our Community Corner last week, we will have another English episode this week Wednesday at 5pm CET. While we won’t have a special guest this time, our Community Developer Bastian will not only give you further insights into the fourth tier but also answering your chat questions. And as one stream is not enough, our Anno Afternoon community crew will return this Friday 5pm CET – Not only Guddy is back on board, we will also jump from the trusty old Closed Beta ship to a newer development version of the game! We plan to bring you more live-streams in future, from development insights with our AnnoCasts to community focused shows like CommunityCorner and AnnoAfternoon. If you do not want to miss a show, make sure to follow out twitch channel to receive notifications as soon as we are online. This week in the Anno Union, we have some exciting news about the upcoming EGX Rezzed convention in London and more live-streams on the horizon with the return of the Community Corner. We do not want to withhold you a teaser for this week’s DevBlog: this time, we will give the cast of our second party characters a spot in the limelight. 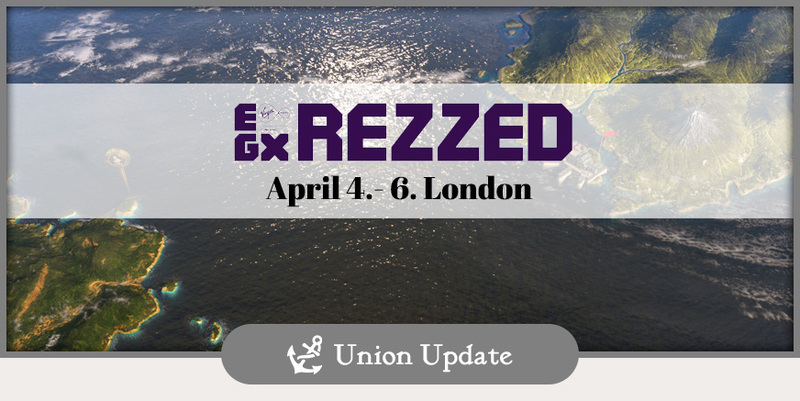 We will bring Anno 1800 to this year’s EGX Rezzed 2019 in London on April 4th-6th. EGX Rezzed is London’s best-loved and biggest games event: a festival of independent gaming that celebrates one of the world’s greatest pastimes. Every year they bring thousands of gamers together in the unique setting of London’s historic Tobacco Dock to play a fascinating variety of games and meet their creators, from tiny student startups to the world’s biggest developers. You will not only be able to play the game at the convention, but our Community Developer will also be there on Thursday to give you some exclusive insights into the game and answer your most burning questions during the Anno 1800 panel April 4th at 4pm! And if you are not able to visit the EGX Rezzed in London, we will host the panel on our Ubisoft Blue Byte Twitch channel. And while we at the topic of streaming, we will have a German episode of our Community Corner stream this week Thursday at 6pm CET, with the German strategy gamer The Writing Bull as a special guest! As you know, we want to bring the world of Anno to as many fans as possible and therefore, we will have another English episode of the Community Corner as well as of the AnnoAfternoon in the upcoming week. We are really happy how many of you watching our streams and sharing your thoughts in the live chat. Keep in mind that we are always looking for feedback and ideas for our live-streams from our community. Let us know what you think of our streams and what you would love to see in the future in the comments below. Community Creations – a stunning centerpiece for the dining room! 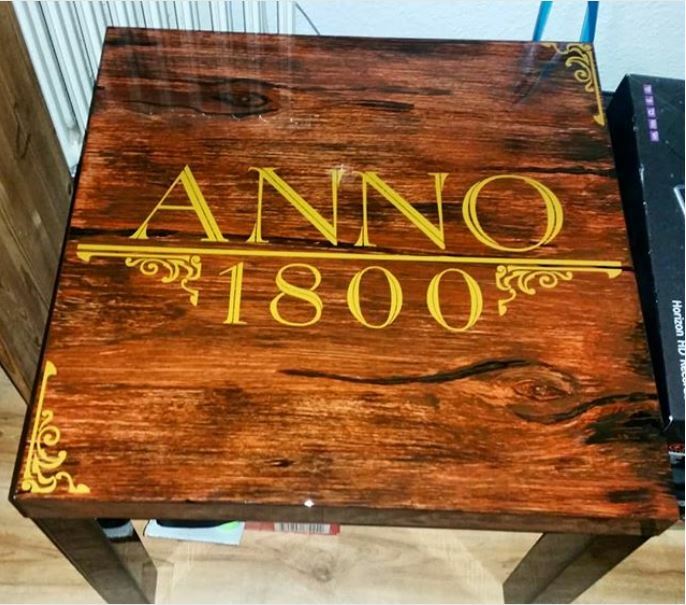 g00fy’s Anno 1800 table, created by his talented friend Martin, is a real eye catcher in any kitchen or dining room! With the 19th century setting, is there anything your will or would like to build, paint or just use to decorate your PC desk for the big release on April 16th? A quick update this week, we’ll have a new Community Roundtable, the Anno Afternoon returns and a Community Spotlight. 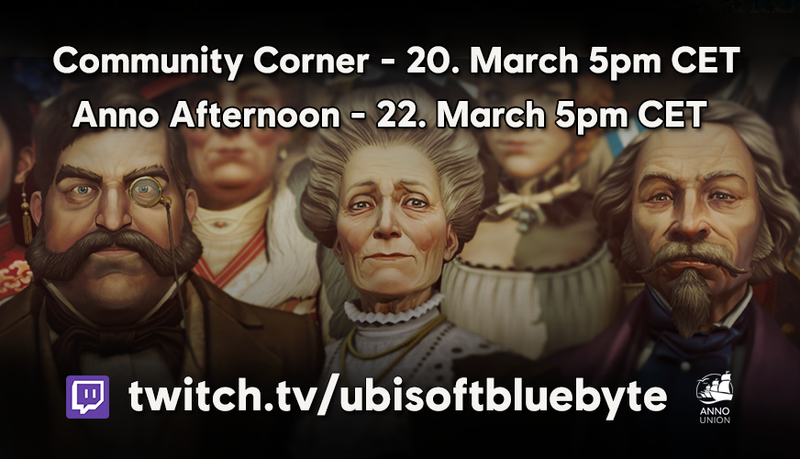 Next week on the 27th, we’ll have another Anno Union Community Roundtable, where the Community Team will answer your questions live. As with the last times, we’ll hold this in the Annoverse Discord. For a better overview, this time we’ll take questions from chat and answer them on voice. This roundtable will be held on English at 19:30 GMT, but if you are able to understand and/or speak German, then you can start at 18:30 GMT already. Join us and ask your questions! This week we’ll have another AnnoAfternoon, this time with Guddy and John, who will continue our existing Anno 1800 savegame. This week, we’ll reckon they reach the Artisans and maybe even the New World? 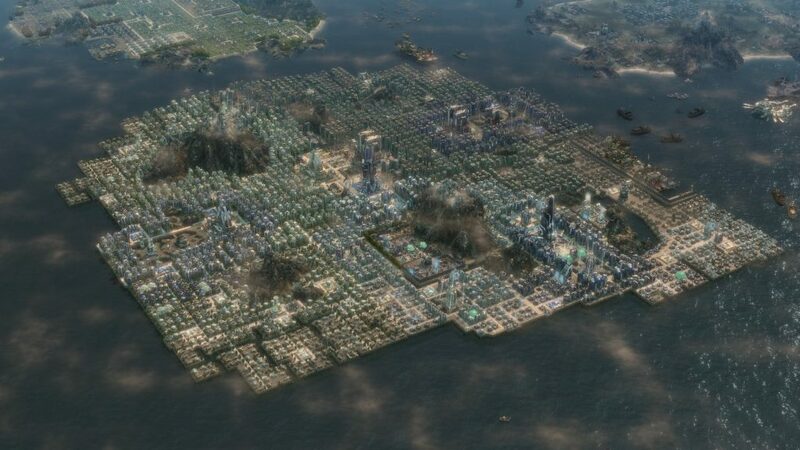 On reddit we recently found this cool megacity build in Anno 2070. User Norkhey expanded the island a bit with a mod and the result looks astonishing. Do you have screenshots of your most gorgeous cities from older Anno games? That’s it for this week! We’ll be back next week with a new Blog! While some of us enjoy the snowy surprise and the resulting winter themed skin applied in many parts of Germany, we bring you another round of our Community questions and answers and streams for the cozy winter days. With this week’s DevBlog: Ornaments, our blog series revolving the development of Anno 1800 returns from its winter hiatus. Next week, we will conquer the winter season with some heat: we hope that you look forward to city incidents such as firestorms, strikes and the season appropriate illness before we raise the curtain for the big feature reveal before our Closed Beta at the end of the month. Save the date as our Twitch devstream will return next week Wednesday January 23rd. This time with Narrative Designer Marie who will demonstrate us how we applied some fresh paint to the quest system in Anno 1800. 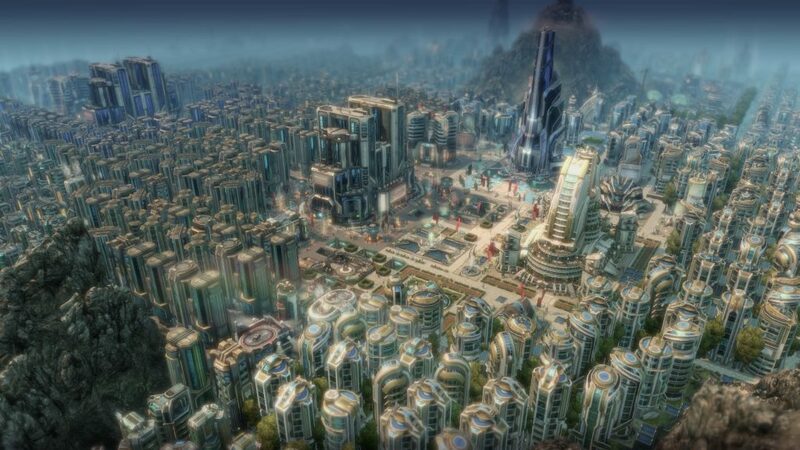 Nevertheless, that is not all as next week Friday, January 25th, Chris and John will be back with their aspiring Anno 2070 utopia. 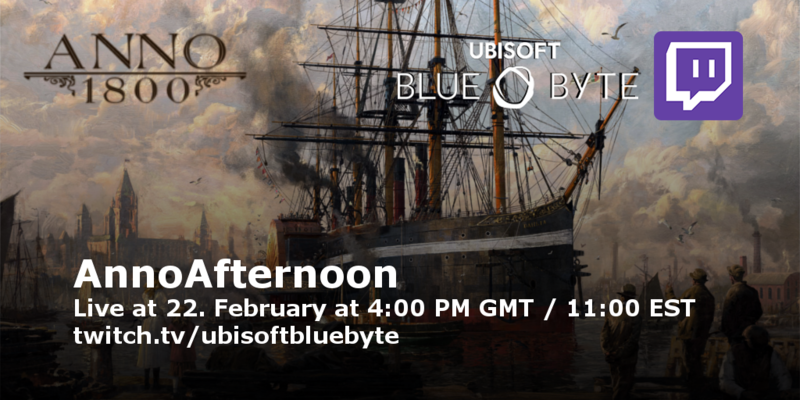 Watch it live on twitch.tv/ubisoftbluebyte – and follow our channel if you never want to miss a show! Will it be possible to change specific sound slider, such as voice, music and effects? I love to tune up the effects and dial down the rest of the game audio. Answer: You will be able to change the following audio levels individually: Master Volume, Menu Sounds, Voice Volume, Music Volume and SFX Volume. Enjoy! Will we only be able to exhibit artefacts in the museum or also art pieces such as statues or paintings? Answer:Exhibits will mainly include cultural artefacts and sets will include statues. Bigger exhibits are displayed in open-air modules and come with their own unique asset while smaller artifacts will be showcased in museum wing modules. By the way: You will be able to place ornaments between your zoo and museum modules freely, which will allow you to create beautiful vistas with statues, fountains or other ornamental structures. Will there be a statistic overview like in 2205 which allows us to see how many units of a certain good we produce at a time? 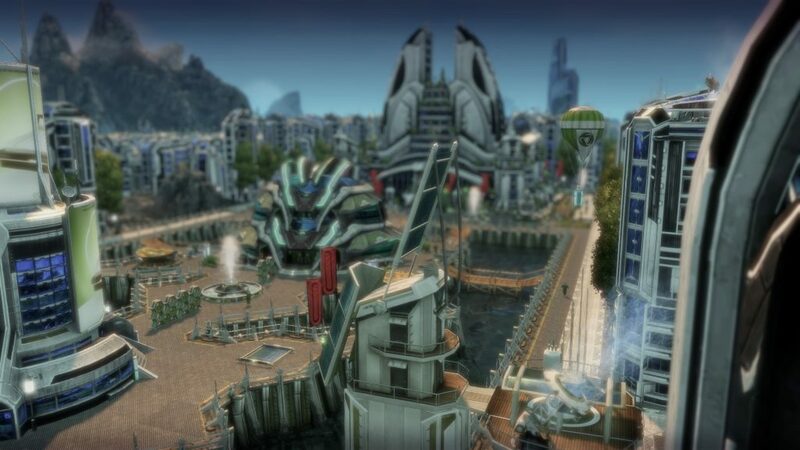 Answer: We won’t have a statistic feature such as the one in Anno 2070 at launch of the game. But we are aware that many of you wish to see a comprehensive overview and statistics of your production, especially when reaching the end-game. We will keep continue to keep an eye on such feedback after the launch of the game. The tooltip of each production building allows you to see how long it takes to finish one good and you will be further able to change the production speed with things like the working condition slider. If you compare the time it takes to create a good compared to the production time of the production of the needed resources, you can easily calculated the most effective rate of production and resource buildings. Furthermore, you can check the overall amount of goods and if their stock is currently rising or declining in the kontor and warehouses. Will it be possible to build sole production islands or will I need to create a new settlement with each island expansion? Answer: Reaching the fourth residential tier unlocks a new building: the commuter harbor. This new building allows you to connect different islands, which also have a commuter harbor and once linked; islands will share their workforce as one global pool. This means that you will not need to create settlements to support your production islands. But beware: an economy which mainly relies on a commuter network is an easy target during war, as one well-directed blow to your commuter harbors can cripple your whole production pipeline. I have read reviews on Anno 1800 where one of the downsides is the small size of land masses to build your empire. Is that a valid concern? It probably would be nice to have the choice of the size of the land mass you get to colonise, much like Civilization I guess. I don’t really want to see small islands close together. Varied terrain type options would also be good. 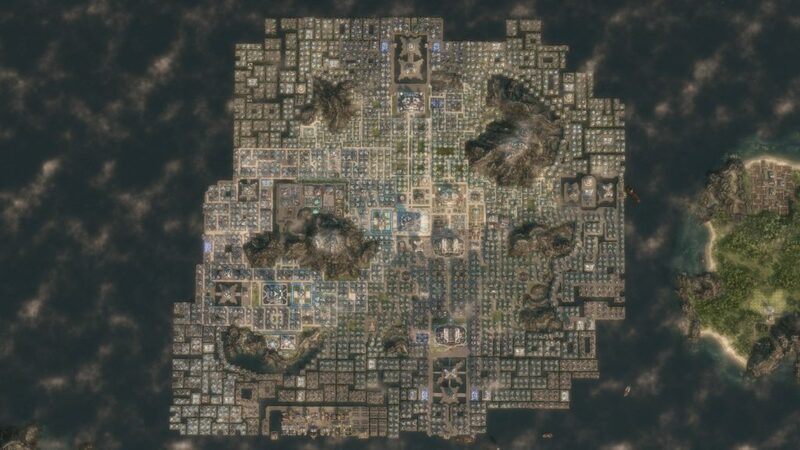 Answer: Anno 1800 will not only have the biggest maps in the history of the series, but also islands with vastest construction space. In the custom game options, you will be able to change the type of island world (which affects the arrangement of islands, such as atolls and archipelagos) and how frequents large islands are on your map. As naval exploration was always an essential game pillar of the Anno series, we further expanded on the ocean space to give you more room for trading networks or open water battlefields for tense ship fights on the high sea. Is a return of the research planned for the game? I loved it in 2070 and 1701 and would like if it celebrates a comeback to the series. Answer: We currently have no planes for a self-contained research feature in Anno 1800. We followed many community discussions revolving research closely and want to provide a few insides how Anno 1800 will cover that topic. In previous Anno titles, research served as an item generator and further allowed you to customize your playstyle with various perks and special abilities. Anno 1800 covers said options with several new features and as player freedom is important for us, we decided against a classic and often restricting “RTS” style research tree. There are many different ways how to acquire items. In addition to quests or trading, you will be able to generate items with the new city attractiveness, the variety of expeditions or the world fair monument. When on a zoological expedition, you will not only be able to acquire animals for your zoo, you can also get your hands on some cultural items or even hire specialists during events, which come with abilities which might not be related to the zoo at all. As an example, a specialist might join you who is able to boost one of your battleships with a special ability. If you want to focus on your fleet of warships, you can run naval themed exhibitions in your world fair or do bounty-hunt expeditions, which will reward you with naval related items such as weaponry or combat savvy specialists. If you prefer to use the power of science to benefit your society, get marvelous new machines from the world fair, which you can slot in your guild houses to boost your factories with various effects. Furthermore, you can make use of the influence system to get bonuses which suit your custom playstyle which are, in contrast to a research tree, are reversible at any time. 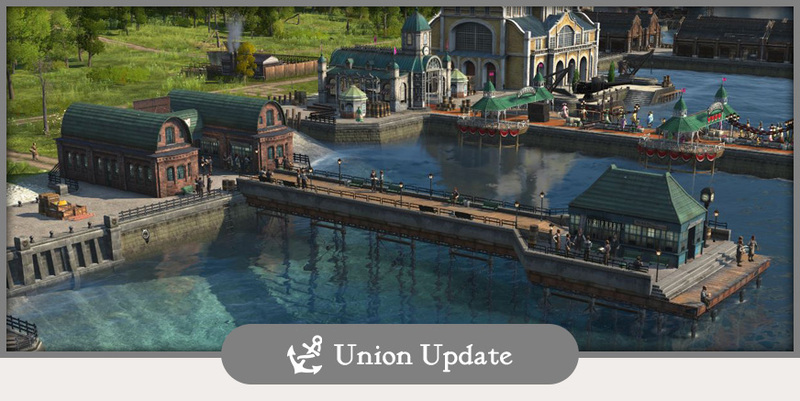 Add more elements such as electricity; Anno 1800 adds various layers, which allow you to optimize or to get experimental with your own unique playstyle. 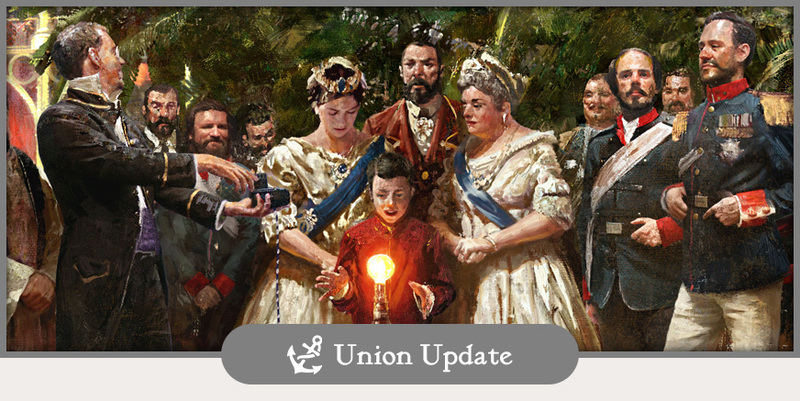 Has it really only been a week since last week’s Union Update? Time sure flies when you are as busy as we are. The final months of game development can be an exhilarating roller-coaster ride, but there is something quite magical about seeing the different strands of your game finally all coming together. And believe us, with a game as feature-rich as Anno 1800, that means a lot of strands to work with! Between the actual development and the travel that is often necessary for various team members in the lead up to a big release, we unfortunately sometimes have less time to bring you new insights on the Union (though we have a feeling that you agree that we should first focus on finishing the game). To cut to the chase – we will not have a new DevBlog for you all this week. We will return to our regularly scheduled programming next week with a look at Diplomacy in Anno 1800. Znacie język polski i checie poznać innych fanów Anno z waszego kraju? Sprawdźcie Anno Polonia na Facebooku! Jest to nowa, ciągle rosnąca grupa, dzięki której będziecie nie tylko na bieżąco z Anno-News, ale również będziecie mieli szansę porozmawiać z innymi fanami Anno. 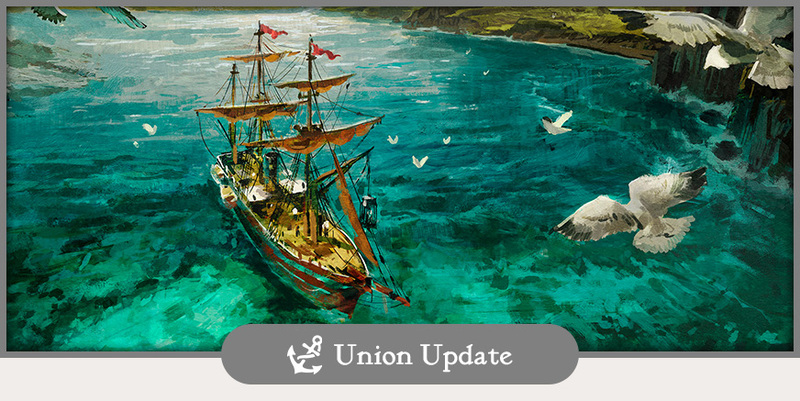 Union Update: And what a pretty ship it is! Our team had to fight their way through a flood of incredible ship designs coming from our creative Union community, and as such, it certainly was not easy to select just one winner. While not every entry met the criteria of creating a variation of the “Imperial Pride” ship, but the general level of creativity and skill on display was highly impressive to us. And while we can only immortalize the winning entry in the game, we will try to showcase some other creations on our various Anno union channels in the future. 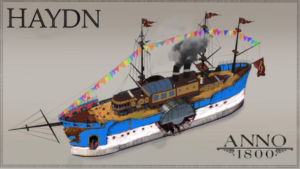 While we liked many of the ideas for mighty warships or utilitarian barges, we fell in love with the idea of the touristic “musical steamer” „Haydn“ by Union member redtoasty. Conceptualized as a “top of the line” luxury ship, we could immediately imagine a crafty investor using lots of paint and decorations to turn a decommissioned steamer into the perfect ship to lure in the ladies and gentleman of high society. Our team will now get to work to turn the „Haydn“ into an actual in-game model for you all to play with. In addition to seeing his creation immortalized in the game, redtoasty will receive an Anno Union shirt as well as our highly limited bronze pins. We also want to say a big “thank you” – and ask you for a hearty round of applause – for all other community members and their submitted designs. Make sure to keep an eye on all of our Union channels to see some of them in the future. 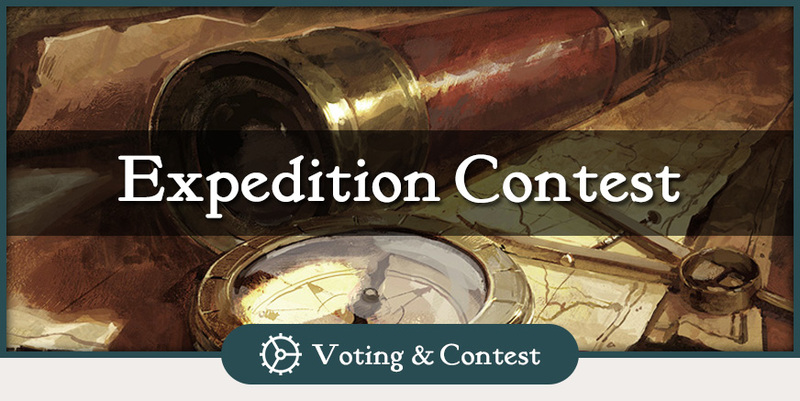 Instead, many of you wanted to know if there was the possibility of running a contest where Union members could try to design their own expeditions. And since we love nothing more than to try and please our players wherever possible, this very contest starts… right this moment! We want to see your ideas and concepts for an expedition that you would love to see implemented in Anno 1800. Come up with your very own ideas for an expedition- from mysterious encounters in lush jungles, to humorous adventures in a harbor tavern far from home or gruesome challenges on the high seas, there are few limits to what you can imagine. Let’s keep it free-form: Simple concepts, short stories or even audio recordings are just some of the ways you could convey your idea. The submission deadline for this contest is October 22nd.